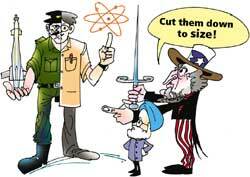 there is enormous distrust over the Indo- us talks on nuclear energy. The top scientist of India's nuclear establishment has openly criticised the us administration for "changing the goalpost" as it moves closer to clinching a deal. The statement by India's Atomic Energy Commission (aec) chief Anil Kakodkar in an interview to an Indian newspaper in the first week of February seems to be an outburst of pent-up anger that has been simmering for long in the Indian nuclear establishment. In July, 2005 India agreed to identify and separate its civilian and military nuclear facilities and place the civilian ones under safeguards stipulated by the International Atomic Energy Agency (iaea) , Vienna, albeit on a "voluntary" and "phased" basis. But as the third round of Indo- us talks wound up in the last week of January, us negotiators, insisted that for the separation to be credible, India should place under inspection all nuclear facilities, that are not directly related to nuclear weapons. Experts say that this violates the Indo- us civilian nuclear cooperation agreement signed by us president George Bush and Indian prime minister Manmohan Singh on July 18, 2005. More importantly, they point out that India, unlike other recognised nuclear weapon states, uses resources from the same set of facilities for both its civilian and military programmes, and their bifurcation would be complicated and costly. All stages of the Indian nuclear programme are interwoven. Says P K Iyengar, former head of the aec, "A successful breeder programme is important for the third stage of India's civilian nuclear energy programme that will use thorium". He then explains: "First generation pressurised heavy water reactors (phwrs) use natural uranium (available domestically), the spent fuel containing plutonium from the phwrs will be used as fuel in a second generation fast breeder reactor (fbr), which is still in the experimental stage. The fbrs, in turn, can produce more plutonium, which will be used to make uranium 233 from thorium, for use as fuel in the third generation reactors". "We have nothing to hide," says Iyengar. "But such safeguards have major nuisance value. It will really be frustrating for scientists to be stopped in the middle of a research project just because each milestone has to be reported to the iaea and kept open for inspection. It will simply double the time required for completing any research project," he argues. India's department of atomic energy is also apprehensive about the protection of its proprietary breeder technology, which it has perfected over the years. The scientists are also piqued at the us' adamant stance that it should have a say in the civilian-military separation. Participating in a debate on the issue recently in New Delhi, Iyengar said the Indian nuclear energy programme is not keeping pace with the goals set just for want of funds. "We only want money, not their expertise, technology or science." Former Atomic Energy Regulatory Board chairperson A Gopalakrishnan was even more scathing: "There is no need for India to surrender its indigenous nuclear power programme, as a sacrificial offering to please the us , in return for the promise of a broader strategic alliance or a great power status for India." According to strategic expert Bharat Karnad, India should insist on using the same separation rules followed by the us. Karnad, a professor at the Centre for Policy Research, New Delhi said the available literature shows that the us excludes four categories of the nuclear installations or research and development facilities from safeguards: those currently used for military purposes, ones co-located with military-use units, those occasionally used for military purposes, and, those whose inclusion in the safeguarded list poses "an incremental risk" to national security. Gopalakrishnan sums up the issue quite aptly, "It is unfortunate that the present government neither provides encouragement nor cares to preserve delicate morale of almost two generations of nuclear scientists who have put India on the world nuclear map."